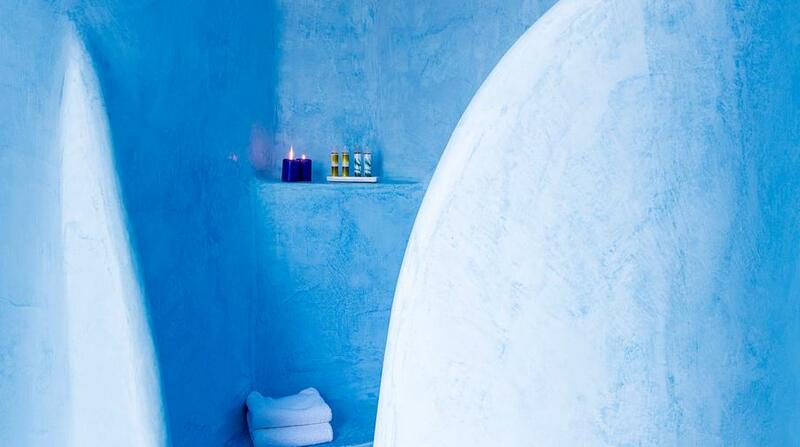 Offering panoramic views of the Aegean Sea and the vineyards of Santorini. 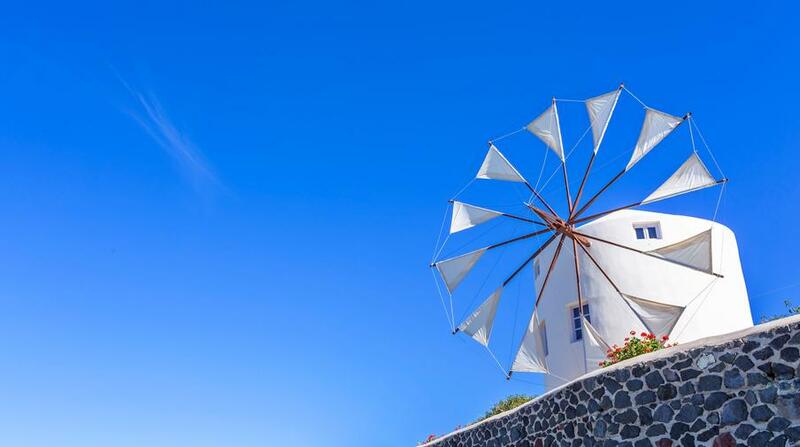 The serenity and quietness of the villa as well as the minimal architecture of the windmill, will more than meet your expectations and will make your stay a memorable one. We stayed at this villa in July as the last stop on a seven month trip round Europe, and could not have picked a more peaceful, serene or comfortable place to stay. It was absolutely wonderful. 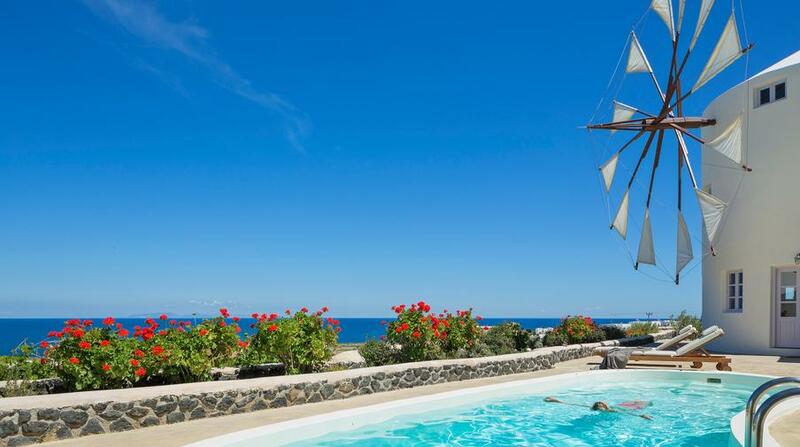 The setting with views over the Aegean from the pool and windmill is lovely, the accommodation itself could not be faulted. Our hostess was extremely friendly and helpful, and cooked us a lovely evening meal on the day that we arrived. It was a wonderful end to a great trip, and I would recommend this place to anyone who is looking for some where special and different to stay. Me my girlfriend and a friendly couple spent 2 memorable weeks at the lovely and romantic villa and would like to share our unique experience. The owner had arranged for us the car hire that included our transfer from the airport to the villa. He welcomed us at our arrival and made us feel like home. He offered us a tour and informed us about the history of the properties. We were offered a delicious welcome meal. We loved the Greek salad and the spaghetti with the vegetable's sauce. The Sigalas white wine was really tasteful and the tour at the winery, just 5km far, was a great experience. The service was great and the house keeper very kind and discreet. What we enjoyed most is the peaceful and the serenity of the location that offered us the required feeling of privacy. We enjoyed very much the sunrise view that was visible from our beds. Very picturesque! The 2 separate bedrooms and the ensuite bathrooms offered us independency. We promise to visit you again in the near future. Our stay in the villa was all we could wish for, peaceful and undisturbed. The cleaning service was second to none and nothing was too much trouble for the owner. 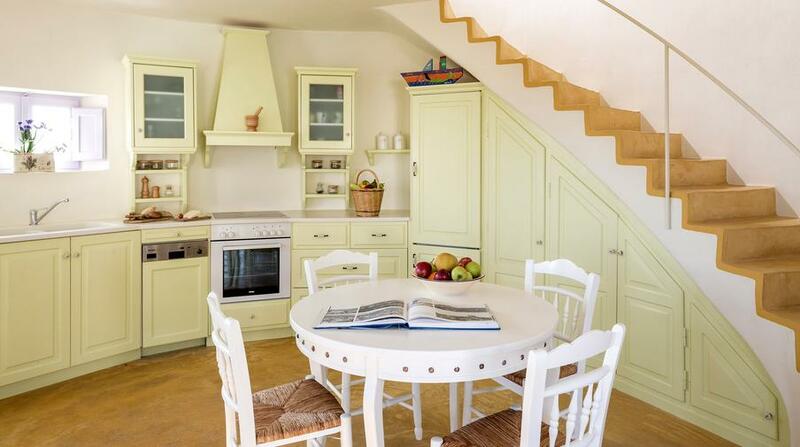 The villa was exceedingly well kitted out and furnished to a very high standard and beautifully designed. If you are looking for a laid-back, quiet holiday then this is it, if you are looking for nearby noisy nightclubs, please stay away! This is the perfect place to relax. We had an amazing experience at this villa!! We were met at the airport with our car rental which we booked through the villa owner and followed them back to the villa (15 mns w/ traffic). Santorini is small but absolutely gorgeous, relaxing and driving is an experience!! The owner welcomed us at the villa which looks exactly like it does in all of the pictures. It is gorgeous!! Every detail has been thought of and anticipated. The decor is beautiful and relaxing. The villa felt like home within minutes, mind you a luxurious home! We had 2 bedrooms on 2 separate floors (each w/ en suite baths as well as a 3rd full bath outside), a fully equipped kitchen (Miele dishwasher! Espresso machine with illy espresso!!) on the ground floor and the loveliest patio by the pool to enjoy meals al fresco while taking in the view. Note that the villas are on the east side of the island so you get sunrise instead of sunset. You can still enjoy sunset over the mountain behind the villa but sunrise is beautiful and can be seen right from bed :) While we settled in the owner made us a welcome dinner of vegetarian pasta (delicious sauce!! ), fresh salad (yummy santorini capers), fresh bread and a bottle of Santorini wine. Lovely touch after our day of travel! There are 3 villas and although they are next to each other, the walls in between keep them totally separate and private. Each villa has its own free private parking and even with the door and windows open, we never heard or saw the other guests next door during our entire stay. The pool area is relaxing with the patio, 4 lounge chairs and a lovely pool that you have all to yourself! The pool also has jacuzzi jets at the push of a button! So much more privacy than the hotels in Fira, Imerovigli or Oia which have all the tourists taking pictures of the views while you try to sunbathe/relax in full view. 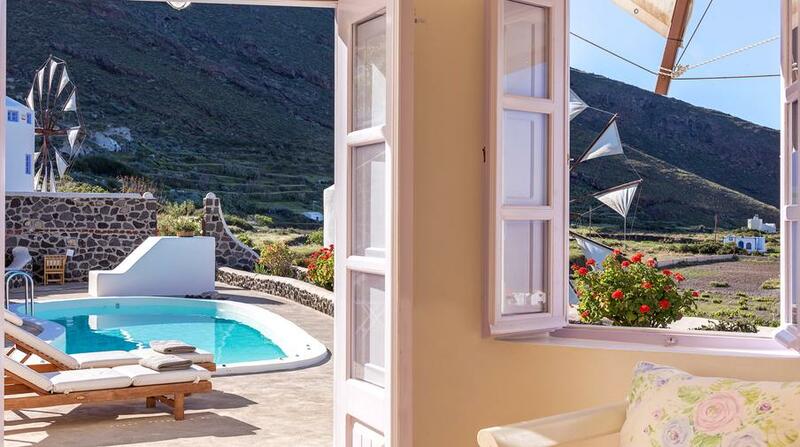 Here you sunbathe to the view of the ocean, vineyards and mountains. There is wifi throughout which is great, a landline for local calls (restaurant reservations!) and even a docking station speaker which we loved! If you forget your iphone converter no worries! You can charge your iphone/ipod and listen to music at the same time :) Great for music while you're out by the pool. There is also a safe available if you need it and plenty of drawer and closet space (for those not packing light!). There is daily breakfast which they bring to you. You just let them know what time you'd prefer it. There is also daily maid service and the housekeeper is wonderful. 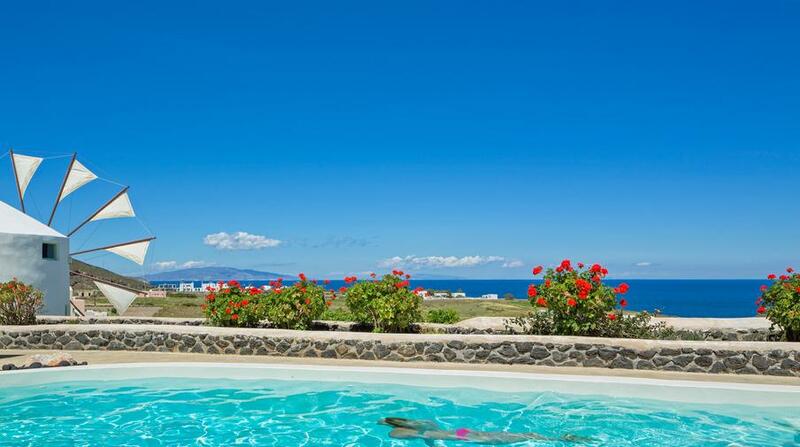 The villa is always super clean and neat and she keeps the pool area and gardens pretty too. She's always keeping busy and you can see how much care goes into the villas. There is even a really friendly greek cat who will stop by to say hello. She's super sweet and cute and has the best life of relaxing at the villas! With our car rental we were able to explore the island, all of the beaches (so many!) and historical sites, the wineries (a LOT) and brewery! It was quite easy figuring it all out. As all roads eventually connect. 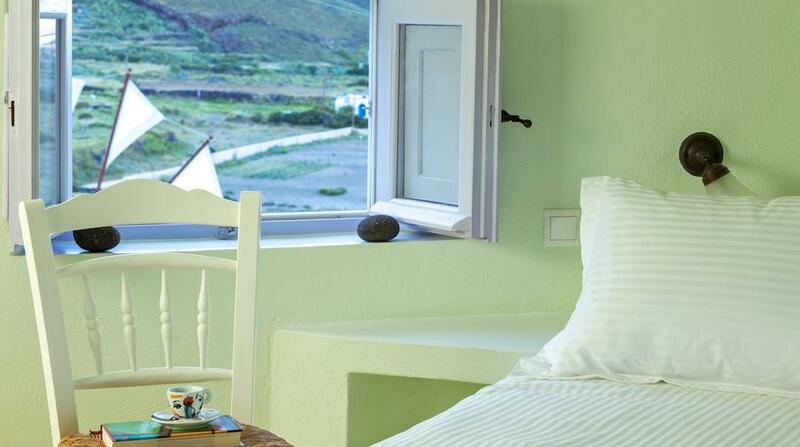 The villas are very close to Fira (capital) and Imerovigli. Parking isn't too bad, Fira actually has a public lot which is free and you just walk a few blocks right into town. At the end of our trip we just dropped the car off at the airport and caught our flight. Super easy! This was by far the most relaxing trip we've ever taken. 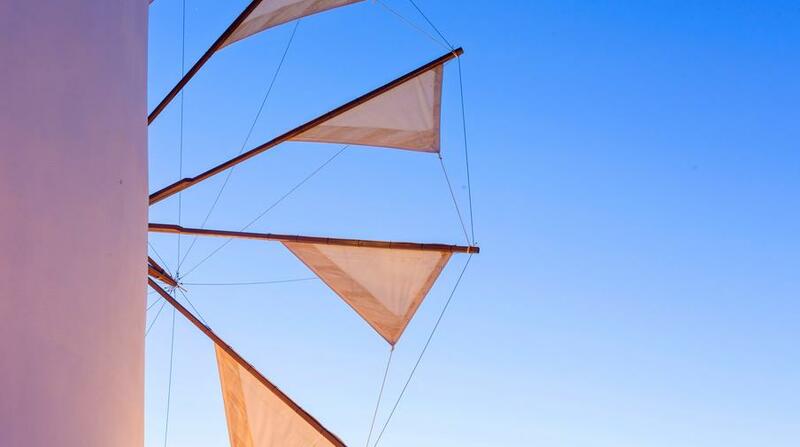 We spent an entire week in Santorini (we chose not to island hop this time) and we had a lovely time. The villa was the best and we hope to be back very soon!! The owner had great recommendations for restaurants and wineries on the island and was available throughout our stay for any questions we had. 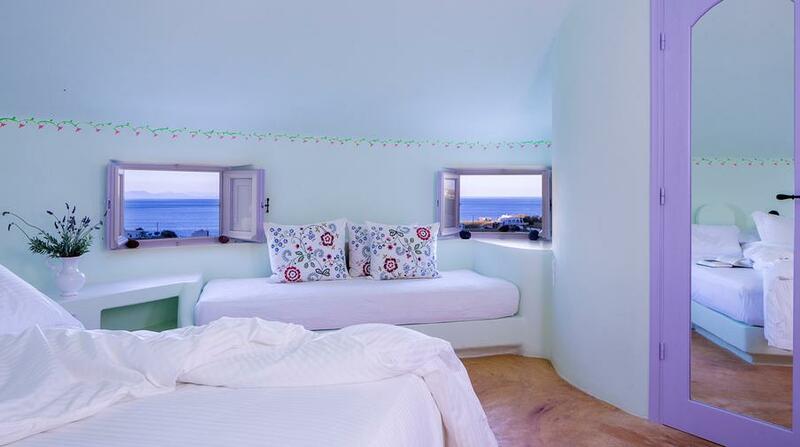 Santorini is a great honeymoon island and the villa was the best decision we made! 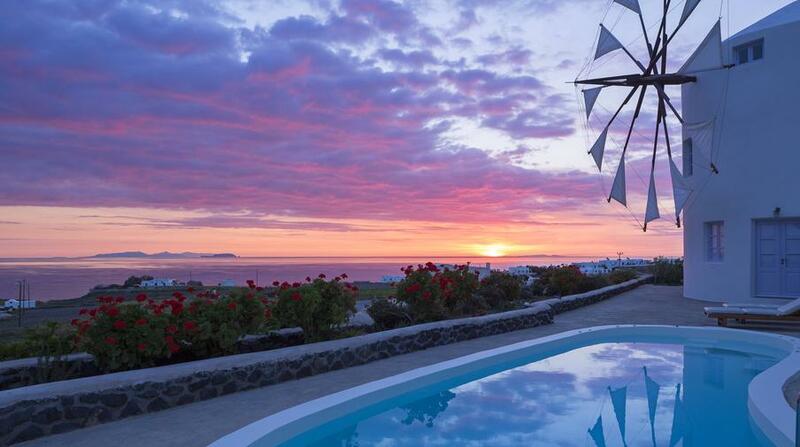 We spent a fantastic week at this villa in Santorini this summer. The photos are accurate; the setting and decor are breathtaking and tranquil. We are a family of five, so the villa fit us perfectly. After a day of exploring the island or cruising the caldera or just playing at the beach, it was so nice to come back to the peace and quiet of the windmills and enjoy our family time together. 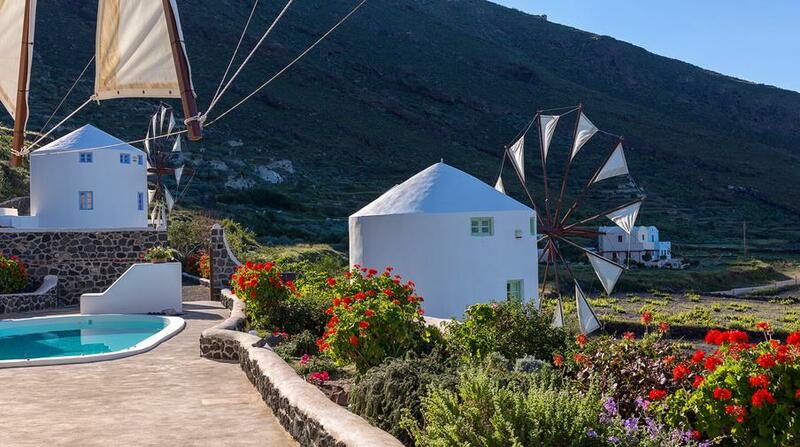 With only three windmills on the quiet side of the island, you will have room and solitude to spread out, relax, and let the setting work it's magic. We spent a week on the island, which some guidebooks say is too much if all you want to do is see the sights. But we also wanted days of relaxing and not caring if we ventured out too far. This was an ideal place to do that from. Sure, we needed a car to get around, but we quickly got accustomed to driving the roads and finding our way around. The owner and architect of the villa was also a lovely hostess. She had a wealth of knowledge and information at her fingertips and was able to tell us the best places to go. She was also adept at reading us and figuring out what kinds of things we would most like. Even the housemaid seemed to work tirelessly. For all seven days, she brought our breakfast, cleaned our pool, and tidied the house, and always with a smile! 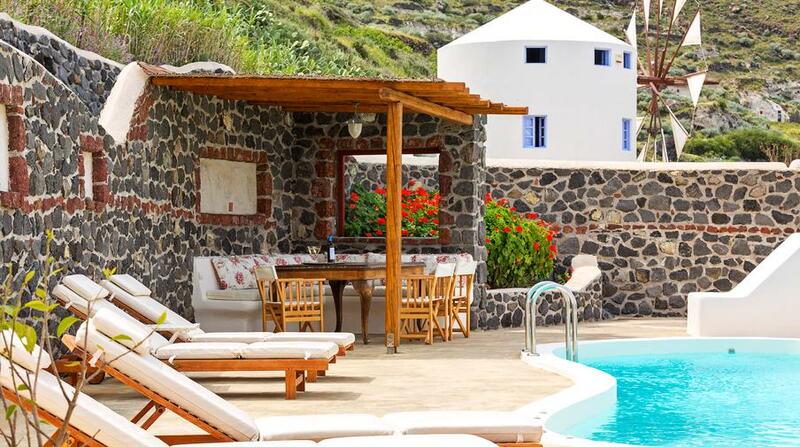 We are very happy with our decision to stay at this place and will book again if we return to Santorini.